Instead of whatever it was I should have been doing, I spent about three hours this afternoon learning about the excavation of Babylon. I got curious about this because I was looking for reconstructions of ancient cities, and those of Babylon all look pretty much the same. Here is a nice one by Rocío Espín Piñar. These paintings all look the same because they all follow the original reconstructions made by the director of excavations at the site from 1900 to 1917, Robert Koldewey of the German Oriental Society. 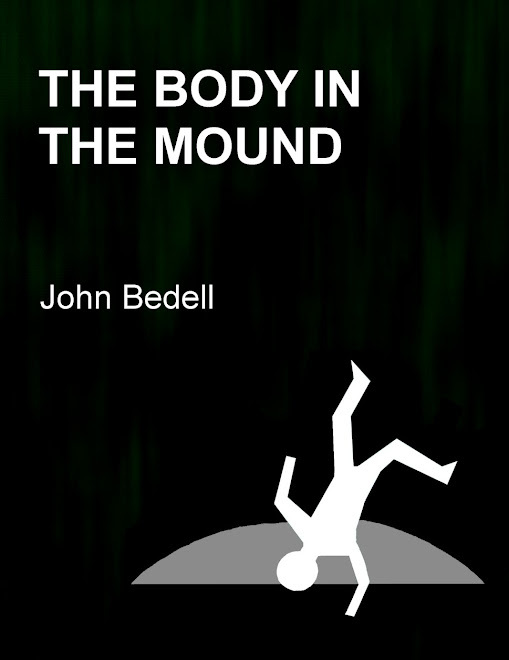 You can get a good sense of Koldewey and his work from a semi-popular book he wrote after the 1912 excavation season, which was quickly translated into English and more recently put online for free. The Excavations at Babylon, translated by Agnes Sophia Griffith, is not a particularly exciting book, but it is concise, well illustrated, and remarkably clear. 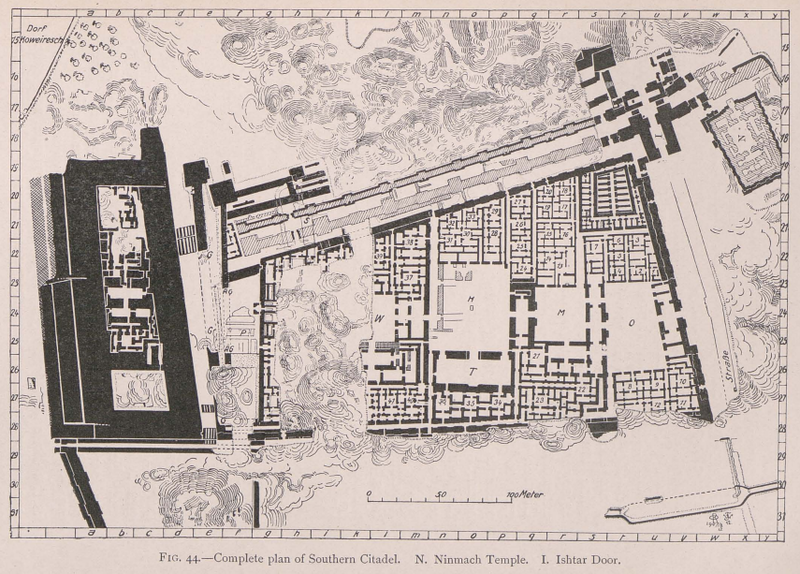 There are many wonderful plans, like this one of the Southern Citadel. Koldewey did a good job of telling us both what he thought his team had discovered and how certain he felt about it. Case in point: he identified a building that he thought might be the Hanging Gardens, but admitted this was mainly because the building was unique and he hadn't found anything else that might be the Hanging Gardens. Archaeologists now think it was a granary, and I subscribe to the theory that puts the Hanging Gardens at Nineveh. Koldewey published this photograph of an assortment of small figurines of apes, which he says were very common finds in residential districts, while freely admitting that he had no idea what they represented. While Leonard Woolley's work at Ur is most famous for the artifacts he uncovered, and Henry Layard's at Nineveh is know for the stone reliefs and sculptures, Koldewey's Babylon is known mainly for its architecture. 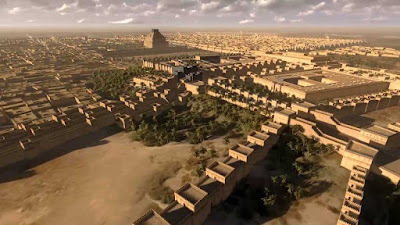 But then Babylon was a truly extraordinary city. The circumference of its walls was 11 miles (18 km), and this was no simple, single wall; behold Koldewey's diagram of the defenses. The most massive wall was 72 feet (22 m) thick. To excavate this vast site Koldewey employed 250 laborers and a dozen surveyors, and they worked most of the year, not some quick field season. One of the discoveries Koldewey made was that shifts in the Euphrates River and a rise in the water table meant that the lower levels of Babylon are now under water; notice the water in the bottom of this excavation. Because of that the early Babylon of Hammurabi is still unknown. 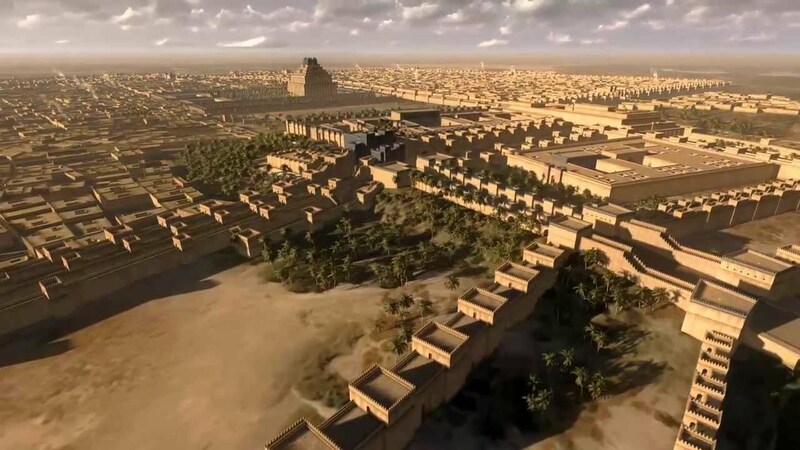 Across most of the site Koldewey's team reached only the last period of the city's glory, when it was the capital of what we call the Neo-Babylonian Empire. 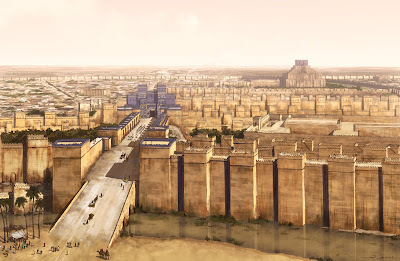 This was the age of Nabopolassar (reigned 626–605 BC) and his famous son, Nebuchadnezzar II (605-562). A few finds were made in residential neighborhoods reaching back to 1400 BC, but in the public areas it's all Neo-Babylonian. We know a remarkable amount about this period. We have several different semi-official chronicles that give us the view of the ruling families, and also a strange class of courtly tales scholars call "novels" that provide fascinating details about the private lives of kings and queens. (The account of Kings David and Solomon in the Bible is one of these.) There are also tens of thousands of clay tablets, many of them from courts and temples but others from merchants and private schoolmasters. We have thousands of inscriptions. And we have Koldewey's archaeology. 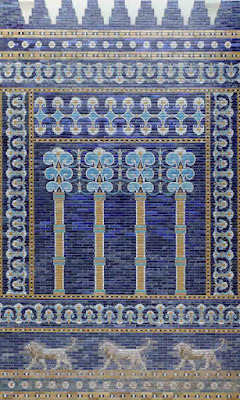 Above, reconstructed tile panel from Nebuchadnezzar's throne room. Conveniently for us, ancient Mesopotamian kings liked to sign their building projects with stamped bricks and tiles; this one boasts of the great building works undertaken by Nebuchadnezzar. So we don't have to guess at who built which phase of the walls or which part of the palace, just dig out a few of the millions of stamped bricks. This is how Koldewey was able to do such a great job of reconstructing the city that only a few details of his work have ever been questioned; mostly it was just a matter of moving massive amounts of rubble, mapping the walls, and reading the bricks. Above, plan of the sacred precinct, with the great ziggurat called Etemenanki, the Foundation Stone of Heaven and Earth. Water tunnel. I shudder to think what it would take me to dig out such a tunnel with modern methods and safety standards. 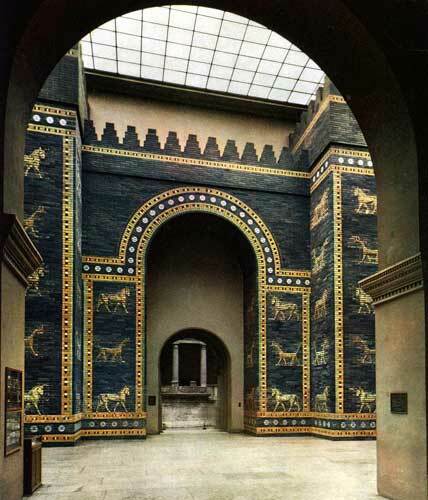 Koldewey's book is of course mostly in black and white, but if you want color photographs of artifacts from Babylon you can find hundreds at the web site of the Pergamon Museum in Berlin. Like the famous onyx scepter (or spindle?) and this tiny onyx turtle. Gypsum head of the Demon Pazuzu. 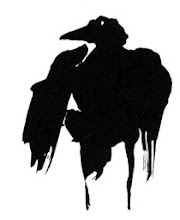 Aren't you glad to know about the Demon Pazuzu?